Leftover candy canes? Now in cookie form! You’ve probably noticed that I haven’t been blogging (or baking) as much over the last few weeks. Between some health issues (now resolved, whoot!) and trying to cut down on my baking so that the DH could lose some weight (it’s hard to watch your weight when your wife is always making delicious things), plus some technical challenges (*shaking fist at combination of mailchimp, hellobar, and sumome apps, plus at self’s lack of technical know-how*), well, the result is blog bog. I’ve been making and photographing some healthier treats (cough*salads*cough) lately, so those will show up on the blog soon. In the interim…let them eat sugar! Or at least cookies. Because the DH came home yesterday and handed me a giant container of candy canes. I looked at him. He said that his coworkers had mentioned the recent dearth of delicious baked goods, and challenged me to use up the leftover candy canes lying around the office that no one would eat. 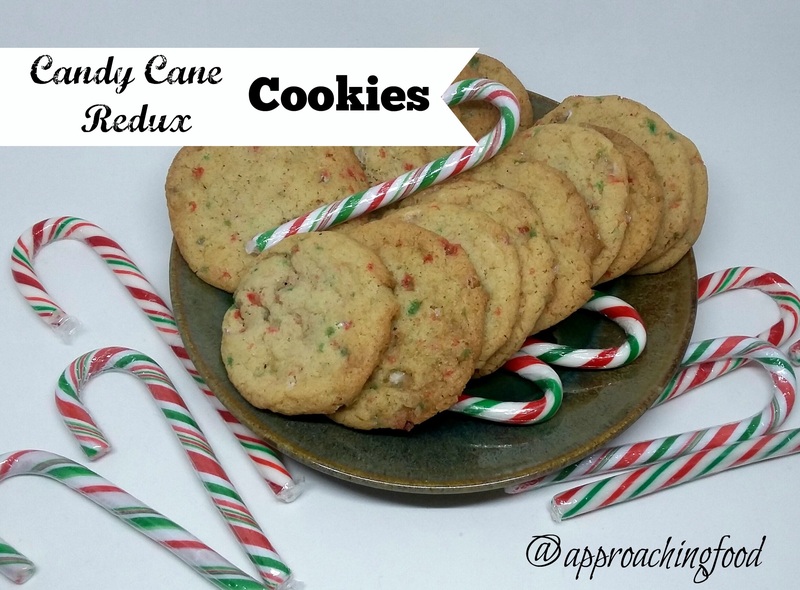 I went on pinterest, I googled different search terms, I experimented with baking different things (did you know that you can bake and shape candy canes? ), and came across some interesting options for leftover candy canes. I told the DH, I bet that if I turn it into candy cane vodka, it’d be gone in a snap! I decided to try something else instead, as I’m pretty sure that however laid-back the DH’s office culture is, the higher-ups would frown on a workforce giddy on peppermint vodka. So, cookies it was! This is a basic cookie base, with the addition of ground candy canes. It’s really not that minty; it just gives a hint of flavour to a buttery, crunchy, sweet cookie. Mix butter, eggs, sugars, and vanilla together until creamy-looking. Mix together flour, baking soda, and salt, and stir into butter/sugar/egg mixture. Once mixed, stir in crushed candy canes. Bake in a 375 degree oven for 8-9 minutes. They will harden as they cool, so take them out of the oven when they’re still a little soft. Let cool on the tray for two minutes (so they don’t fall apart), and then transfer to a cooling rack. These cookies are much easier than you’d think, and really are a great way to use up those candy canes that are festive in December and mere unwanted calories in January. Best to turn them into delicious, wanted calories, yes? Tee hee! Next Post: More minty goodness, with chocolate peppermint whoopie pies! Or…faro salad with baby spinach and roasted greens? Hmm, choices, choices. Linking up at Meal Plan Monday! And Meal Plan Monday – Cookie Edition! This entry was posted in Cookies, Waste Not Want Not on January 20, 2017 by Margaret. Thanks, Becky! The DH took then to the office and they disappeared rather quickly!